5 Steps to a Healthy Beard. - Mad Viking Beard Co.
Home/Blog/Beard Growth/5 Steps to a Healthy Beard. I would pat it dry and try to get about 90% of the water out of my beard. Beard oil is the foundation to a truly great and healthy beard, and I would apply beard oil daily to keep my skin and beard healthy. Mad Viking beard oil is great to reduce beard itch, dry skin, and split ends! When apply the oil, I first go under my beard and apply to my skin, then I use the extra to lube up the rest of my beard. As for how much I use would be about 11-12 drops or 9-10 squirts because of the length and thickness of my beard. So about 15 to 20 minutes after applying the beard oil I would apply Mad Viking Beard Balm. I would Scoop some out with my finger, put it in the palms of my hand and rubbing them both together making sure I have an even coverage of balm on my hands and fingers, heating it up in my hands at the same time with the friction. I apply it by massaging the balm down to my skin and working it out to the end of my beard. After I apply the oil and balm, I would comb it out. A good beard comb is critical, and I use a comb with wide teeth to avoid static and snagging. First, I start by going under my beard and comb everything out, away from my face. Once it’s combed out, I comb it down and into place This up then down trick give me a fuller look and leads to less tangles and helps me style it just the way I like. 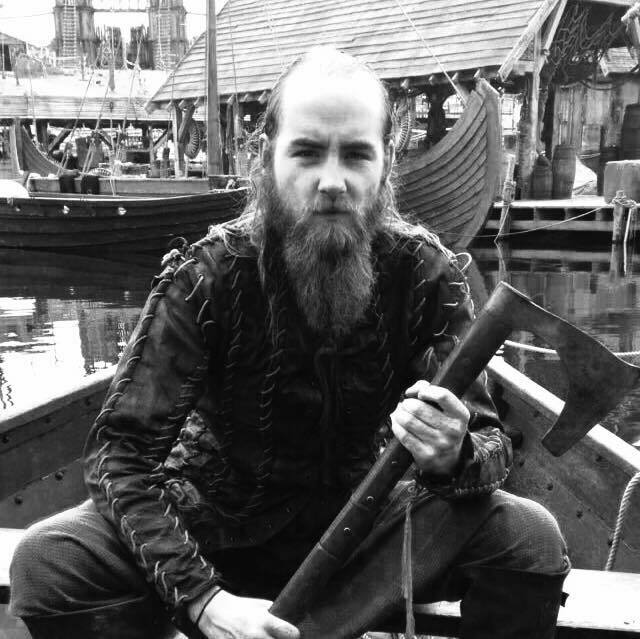 Darren Finnegan currently resides In Ireland, can be seen on Both hit TV shows Vikings and Game of Thrones, and is a proud member of the Official Mad Viking Beard Team.